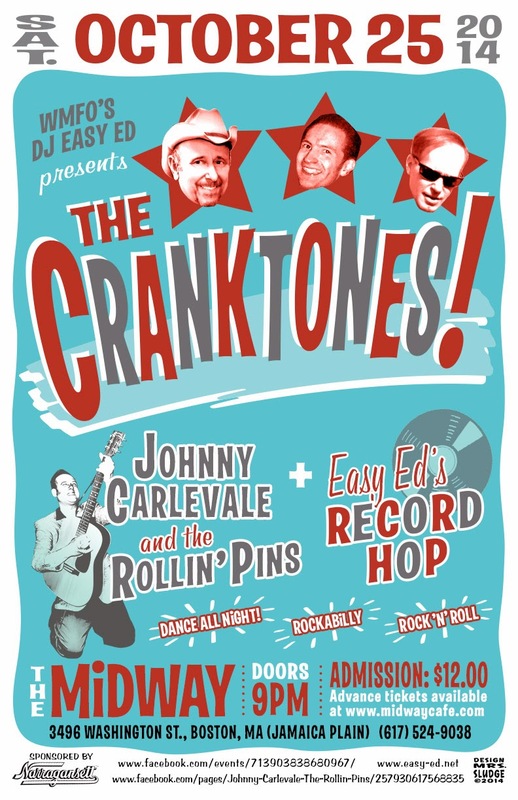 October 25, 2014: The Cranktones, Johnny Carlevale and the Rollin' Pins, Easy Ed's Record Hop! Fasten your seat belts for a real rockin' ride! The Cranktones are reuniting for an encore show that will leave you breathless. Rock ‘n’ roll, rockabilly, and hillbilly boogie at it’s blast-off best! Saturday, October 25, at the Midway Cafe in Jamaica Plain, Boston's premier rockabilly band makes a rare appearance with the three original members Frankie Blandino (The Spurs, The Fathoms), Stan Koslowski (The Spurs, The Barley Hoppers), and Johnny Sciascia (The Spurs, Eilen Jewell Band) playing their unique high-energy tunes that will have your toes tapping and your feet dancing across the floor! Special guests Johnny Carlevale and the Rollin’ Pins will open the show. This young, high-energy band is riding high after a featured performance at the 2014 New England Shake-Up in Sturbridge, MA. Early, late, and on the band breaks, Easy Ed’s Record Hop will be spinning rockabilly, hillbilly, and ‘50s and early ‘60s rock ‘n’ roll and R&B. Dance-friendly 45s for folks who love to move their feet.